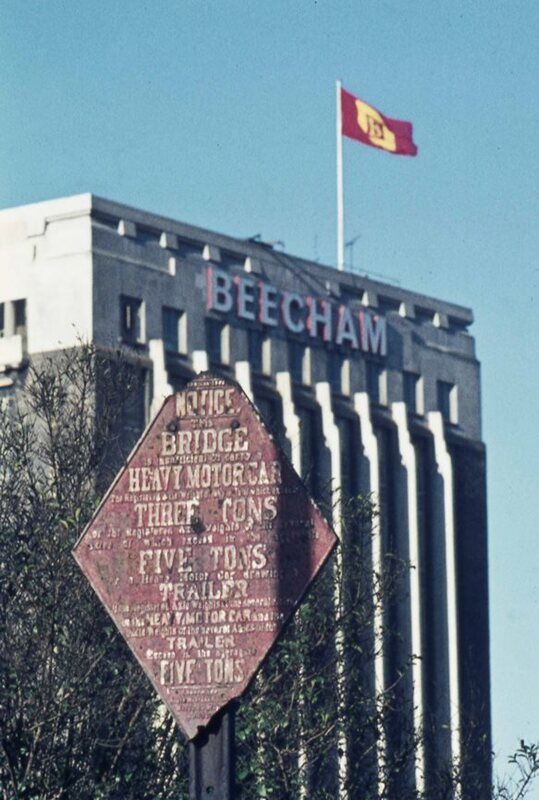 Peter Young took this photo of the 11-storey tower of the Beecham building on a crisp winter's day, 22nd January 1973; however the focus is on the rusted, diamond-shaped road sign. The Motor Car Acts of 1896 and 1903 introduced signage to warn of the weakness of bridges constructed in the 18th and 19th centuries. These were built when traffic was light and there were fears they were not strong enough to withstand heavier vehicles such as buses and goods transport. The article notes that 'Experience has shown, however, that the vast majority of these so-called "weak" bridges have proved capable of carrying without visible ill-effects much heavier vehicular traffic ... than was ever contemplated.' The article rumbles on in detail about construction techniques and later Acts - a Google on 'notice this bridge is insufficient' will turn up this article for you to read at leisure. The use of capitals and lowercase is eccentric and perhaps not easy to read at speed , but it would not be easy to miss the sign.